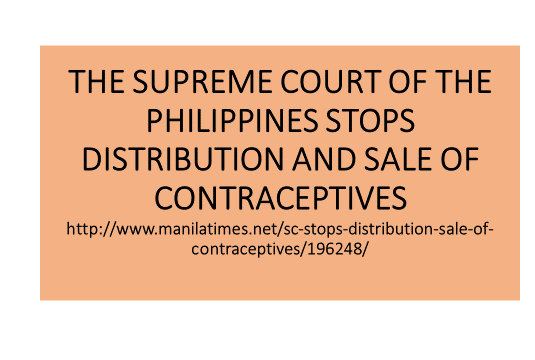 SC stops distribution, Sale of Contraceptives | ALLiance for the Family Foundation Philippines Inc. THE 2nd Division of the Supreme Court has issued a temporary restraining order stopping the Department of Health from authorizing the distribution and selling of contraceptives as mandated by the controversial Responsible Parenthood and Reproductive Health Act of 2012 (Republic Act 10354). The decision by the SC Division chaired by Associate Justice Antonio Carpio was handed down during deliberations held last June 17, court insiders told the Manila Times. The DOH was haled into court by Maria Concepcion S. Niche, president of the Alliance for the Family Foundation Philippines after the agency allegedly failed to abide by the guidelines set by the high court in implementing the law. The group claimed that the contraceptives being distributed and sold did not pass Food and Drug Administration (FDA) scrutiny. The SC has enjoined the DOH or its representatives and agents from granting any and all pending applications for registration and/or recertification for reproductive products and supplies including contraceptive drugs and devices. The high tribunal also stopped the DOH from procuring, selling, distributing, dispensing or administering, advertising and promoting the hormonal contraceptive Implanon and Implanon NXT. It was alleged by the petitioners that the FDA had already certified that Implanon and Implanon NXT appears to have abortifacient character, hence, grave abuse of discretion was committed by the DOH in allowing the sale and distribution of the said drugs. The petitioners also assailed the move of the DOH in approving contraceptives without the necessary public hearing or consultation as required by law. The SC has also ordered Health Secretary Janet Garin to explain and comment on the petition within 10 days.